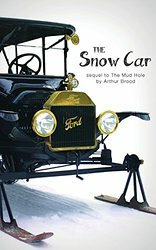 After reading the first book by Arthur Brood called The Mud Hole, I felt like I was being welcomed back into the home of an old friend when I began reading again about the Morrison family in his next book, The Snow Car. Although I enjoyed the continuation, you can easily pick up The Snow Car and read it on its own. The book begins in the fall of 1912, with 11-year-old Henry learning to drive his family’s Model T car. I loved the banter between the characters, which made me feel like a participant, rather than an observer of the action. In this book the reader gets to follow Henry’s adventures during the snow months of 1912 as he uses the Model T to add excitement to activities such as driving, sledding, or Christmas festivities. He gets to try out his inventions until faced with an emergency which threatens the entire town. Can Henry help them using his creativity and determination? You’ll excitedly read each page of the book to find out. As an added benefit, once again Arthur Brood adds “Did You Know?” sections to the end of each chapter to give the reader valuable facts about the history of the automobile, like how the pedals and levers are laid out differently by type of car, the invention of wipers, and the chore of lighting headlamps before they became electric. I found the story to be a great adventure that any kid will enjoy reading. If you are interested in cars, you’ll really enjoy how the facts about the cars are woven into the story, reinforcing the information you learn at the end of each chapter. I found the determination of the 11-year-old Henry to be something every reader will admire and try to emulate. The author has found the perfect balance of adventure, education, and character development that will make this a “must read” on every teacher’s and parent’s lists this year. You can purchase The Snow Car on Amazon.com.